Prior permission is required before hyperlinks are directed from any website to this site. Permission for the same, stating the nature of the content on the pages from where the link has to be given and the exact language of the hyperlink should be obtained by sending a request at contactus@pacificejournals.com. This website may record your visit and logs the following information for statistical purposes- your server’s address; the name of the top-level domain from which you access the Internet (for example, .gov, .com, .in, etc. ); the type of browser you use; the date and time you access the site; the pages you have accessed and the documents downloaded and the previous Internet address from which you linked directly to the site. Your email address will only be recorded if you choose to send a massage. It will only be used for the purpose for which you have provided it, however, it may be added to a mailing list. Your email address will not be disclosed, without your consent. If you are asked for any other Personal Information you will be informed how it will be used if you choose to give it. If at any time you believe the principles referred to in this privacy statement have not been followed, or have any other comments on these principles, please notify the webmaster at contactus@pacificejournals.com. Per-session cookies serve technical purpose, like providing seamless navigation through this website. These cookies do not collect personal information on users and they are deleted as soon as you leave our website. The cookies do not permanently record data and they are not stored on your computer’s hard drive. The cookies are stored in memory and are only available during an active browser session. Again, once you close your browser, the cookie disappears. We do not collect personal information for any purpose other than to respond to you (for example, to respond to your questions or provide subscriptions you have chosen). If you choose to provide us with personal information-like filling out a Contact Us from, with an e-mail address or postal address, and submitting it to us through the website- we use that information to respond to your message, and to help you get the information you’ve requested. We only share the information you give us with another Government agency if your question relates to that agency, or as otherwise required by law. For site security purpose and to ensure that service remains available to all users, this computer system employs commercial software programs to monitor network traffic to identify unauthorized attempts to upload or change information, or otherwise cause damage. Except for authorized law enforcement investigations, no other attempts are used for no other purposes and are scheduled for regular deletion. Unauthorized attempts to upload information or change information on this service are strictly prohibited and may be punishable under the Indian Information Technology Act. PaGe has chosen to apply the Creative Commons Attribution License (CCAL) to all manuscripts to be published. This website is designed, developed and maintained by PaGe. Though all efforts have been made to ensure the accuracy and currency of the content on this website, the same should not be construed as a statement of law or used for any legal purposes. In case of any ambiguity or doubts, users are advised to verify/check with the Editor-in-Chief on contactus@pacificejournals.com or other source(s), and to obtain appropriate professional advice. Under no circumstances will this site be liable for any expense, loss or damage including, without limitation, indirect or consequential loss or damage, or any expense, loss or damage whatsoever arising from use, or loss of use, or data, arising out of or in connection with the use of this website. These terms and conditions shall be governed by and construed in accordance with the Indian Laws. Any dispute arising under these terms and conditions shall be subjected to the jurisdiction of the courts of India at Delhi. The information posted on this website could include hypertext links or pointers to information created and maintained by other organizations. PaGe is providing these links and pointers solely for your information and convenience. When you select a link to an outside website, you are leaving the PaGe website and are subjected to the privacy and security policies of the owners/sponsors of the outside website. We are not responsible for the protection and privacy of any information which you provide whilst visiting other sites and such other sites are not governed by this privacy statement. We advise you to read their privacy policies before providing your personal information to such sites. PaGe does not guarantee the availability of such linked pages at all times. PaGe cannot authorize the use of copyrighted materials contained in the linked websites. Users are advised to request such authorization from the owner of the linked website. We do not sell, trade, or otherwise transfer to outside parties your personally identifiable information. This does not include trusted third parties who assist us in conducting our business, or servicing you, so long as those parties agree to keep this information confidential. We may also release , use or disclose your information when we believe such release of information is necessary to comply with any applicable law, regulation, legal process or enforceable statutory requirement, enforce our site policies, or protect ours or others rights, property, or safety as required or permitted by law. It is unacceptable and unethical to withdraw an Article from a journal just because it is being accepted by another journal or the Author wishes to submit the Article to other Journal, which, for any reason, he considers better than the current Journal. In cases of withdrawal after publishing, punitive measures in the form of a fine or a ban on submitting Articles to the same journal can be taken by the PaGe Journals. It is a general principle of scholarly communication that the editor of a journal is solely and independently responsible for deciding which articles submitted to the journal shall be published. In making this decision the editor is guided by policies of the journal’s editorial board and constrained by such legal requirements in force regarding libel, copyright infringement and plagiarism. An outcome of this principle is the importance of the scholarly archive as a permanent, historic record of the transactions of scholarship. Articles that have been published shall remain extant, exact and unaltered as far as is possible. However, very occasionally circumstances may arise where an article is published that must later be retracted or even removed. Such actions must not be undertaken lightly and can only occur under exceptional circumstances. In all cases, office of Pacific Group of e-Journals will retain all article versions, including retracted or otherwise removed articles. Only used for Articles which have not been published yet by PaGe and which represent early versions of articles and sometimes contain include errors, or are discovered to be accidental duplicates of other published article(s), or are determined to violate our journal publishing ethics guidelines in the view of the editors (such as multiple submission, bogus claims of authorship, plagiarism, fraudulent use of data or the like, or may have been accidentally submitted twice, etc.) may be “Withdrawn” from our group Journals. Withdrawn means that the article is archived in our database and not further acted upon. If an Article is withdrawn from PaGe Journals, no penalty will be levied. However, if the APC has been paid for any Article already accepted for publication,then this APC shall not be refunded in any case. Depending upon the severity of the errors, the Author(s) may also be banned from submitting their article to PaGe Journals. 1. A withdrawal note titled “Withdrawn: [article title]” signed by the authors and/or the editor is published in the paginated part of a subsequent issue of the journal and listed in the contents list. 4. The HTML version of the document is removed. A penalty will be levied even if the Article is allowed to be withdrawn after its publication from PaGe Journals and the APC which has been paid for this Article shall also not be refunded. Depending upon the severity of the errors, the Author(s) may also be banned from submitting their article to PaGe Journals. In an extremely limited number of cases, it may be necessary to remove an article from the online database. This will only occur where the article is clearly defamatory, or infringes others’ legal rights, or where the article is, or we have good reason to expect it will be, the subject of a court order, or where the article, if acted upon, might pose a serious health risk. In these circumstances, while the metadata (Title and Authors) will be retained, the text will be replaced with a screen indicating the article has been removed for legal reasons. Further, the APC paid towards the article publication shall not be refunded and the Author(s) will be banned from submitting their article to PaGe Journals. In cases where the article, if acted upon, might pose a serious health risk, the authors of the original article may wish to withdraw the flawed original and replace it with a corrected version. 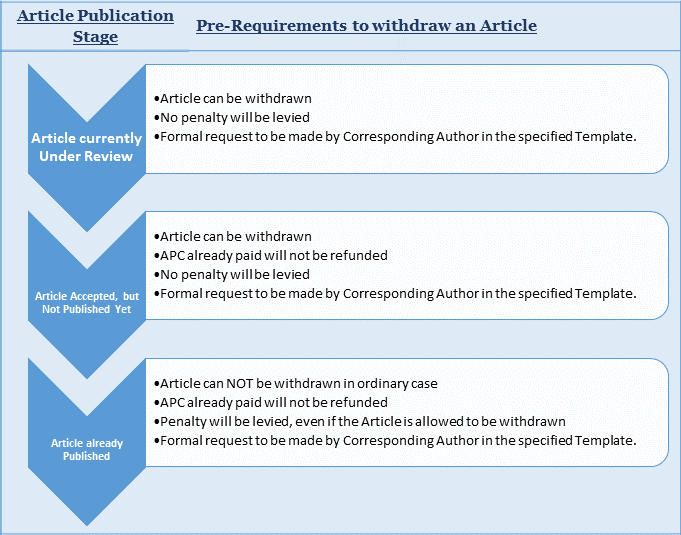 In these circumstances the procedures for ‘Article withdrawal after Publication’ will be followed with the difference that the database Withdrawal notice will publish a link to the corrected re-published article and a history of the document. This process will attract the Penalty. Depending upon the severity of the errors, the Author(s) may also be banned from submitting their article to PaGe Journals.